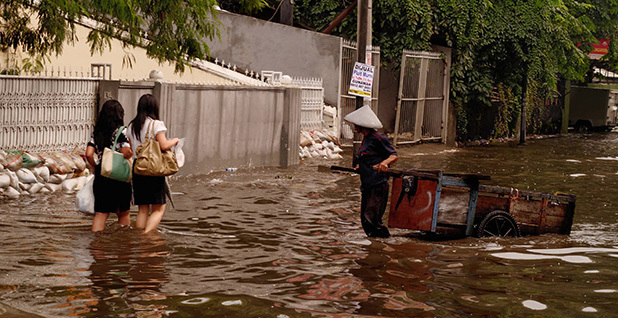 Flooding in Jakarta, Indonesia, in January 2013. Photo courtesy of Flickr. A few hours after the magnitude-7.8 earthquake rocked Nepal on Saturday, the American Red Cross shared a post on its Facebook wall from sister relief operations expressing sadness for those affected by the temblor and urging people to follow the International Red Cross for up-to-date information. Early the next morning, the Red Cross posted again, this time with four photos from operations on the ground and a message urging people to check the website for updates and information on how to help. Sunday evening, another post went up, this time with a link showing people where they can donate to the recovery efforts. A similar post on three ways to help was up Monday afternoon, offering viewers the hashtag #NepalQuake. Those messaging choices were not only deliberate but driven by the conversation the Red Cross social media team has been watching, said Curtis Midkiff, director of social engagement for the American Red Cross. Simply put, he said, the information people are seeking is changing as details unfold about the extent of the damage in the Himalayan nation. "If you trace it back from Saturday to now, you'll see we started with providing basic information to telling people how they can help," he said. "It's all related to what we're seeing on social." Increasingly, aid organizations, app developers, companies, even the U.S. government and creators of social media platforms are offering tools that leverage the information people volunteer during crises in the hope that it can be used to aid in recovery and rescue. Social media is a powerful tool in part because of its growing ubiquity. Nearly 75 percent of adults who use the Internet use social networking sites, according to research conducted by the Pew Research Center in 2014. According to a report by digital media marketing firm eMarketer, nearly one in four people worldwide use social networks, and by 2017, that number will top 2.55 billion. During a disaster, people need information to help them make sense of what has happened, said Matthew Seeger, professor of communication at Wayne State University in Michigan, who specializes in crisis and risk communication. Social media has emerged as one of the best ways to disseminate and receive information. A 2009 study by the American Red Cross found that social media is the fourth most popular place for people to access emergency information. "We have an incredibly powerful device in our hands," Seeger said. "Social media gives us real-time or near-real-time information flows around a disaster, and that is powerful." For the American Red Cross, the 2010 earthquake in Haiti was the first time the organization realized the power of social media. Since then, its operations have grown to include three social media command centers, physical locations where digital volunteers and employees engage with people who reach out to the Red Cross on platforms like Facebook and Twitter, in Washington, D.C.; San Jose, Calif.; and Dallas. Inside the centers, the analytics tool Radian6 helps to visualize and sort through buckets of interactions from the Web. That doesn't even touch on the more than $43 million relief agencies received through donate-by-text programs, a Pew Research Center study on real-time charitable giving found. Ninety-five percent of the people who texted in to the Haiti campaign were first-time donors to the American Red Cross, Jana McAndrew, manager of online fundraising at American Red Cross, told Mobile Marketer in an August 2010 interview. When a disaster hits, Midkiff said the Red Cross begins by listening to those affected. Social media is part of where that information comes from and helps shape what help and support the organization should provide. "From the engagement side, social media is very important," he said. "Moving forward, we're continually looking at how it's evolving." And evolve it must, Seeger said. "In an era of emerging risks, which we have right now -- a greater probability of natural disasters -- we have more of these dramatic events then we've had before, and they're more significant in terms of consequences," he said. "In that era, we need greater capacity on an organizational, group and community capacity level, and social media can help us do that." Climate change is already responsible for a fivefold increase in natural disasters like floods, storms and heat waves since the 1970s, according to a 2014 report from the World Meteorological Organization. In the future, the Earth can expect fewer storms, but they will most likely be more intense, according to NASA scientists. But if you have information coming in from ground zero of a natural disaster, it can be used not just to disseminate information during and after the event, but also to map what's happening on the ground and use that to prepare for future events. Every year during the rainy season -- between November and April -- the streets of Jakarta, the capital of Indonesia, undergo extensive flooding. It is challenging to get accurate flood maps that show the extent of the damage. Jakarta has also been called the "Twitter capital of the world," and during flooding events, people send almost 900 tweets per minute, often with detailed descriptions of the flooding and geo-specific tags, according to research presented this month at the General Assembly of the European Geosciences Union in Vienna. Researcher Dirk Eilander, a flood expert with Deltares, an independent institute that does water research, mined tweets from Jakarta for mentions of "banjir," or the Bahasa Indonesia word for flood. Deltares partnered with another Dutch organization, Floodtags, a social media data-mining company that took the digital mentions and cleaned them up. The data was then superimposed over digital elevation maps to create real-time representations of the extent of flooding in Jakarta. Compared with photos from the ground, the maps lined up pretty well, Eilander said. "A single tweet is quite uncertain," he said. "But if you look at a bunch of tweets together, you can get quite accurate information." So far, this tool has only been piloted with flood events from February of this year, but Eilander said he sees big potential for this technology to be used for other natural disasters. The real-time aspect of the mapping can give rescue teams timely information on evacuation routes or what areas need aid, he said. Looking forward, the Twitter data could help rescue management teams prepare for future floods because the maps can be used to study flood risk. "You could speed up recovery efforts by being able to make a quick assessment," he said. Eilander said there are challenges to using data from social media. Sometimes tweets lack location-specific information, but the software is being improved to automatically read social media messages in a more sophisticated way. Ultimately, he said, the more information imputed, the more accurate the flood maps will be. "Mostly you see Twitter being used in relation to natural disasters by emergency services, communicating with people or telling them to evacuate," Eilander said. "Our method proposes to use the information people put on Twitter and use it to help emergency services make better decisions." Thanks to the Internet, the traditional crisis communication model is a thing of the past. Historically called the "command post perspective," it consisted of emergency management professionals collecting data after a disaster, giving it to a central authority, who would speak to the media, and the media would communicate to the public the status of the emergency. That method of one-way communication does not always represent the experiences of the people in the event, but social media has ripped open the information floodgates, Seeger said. "Social media allows people to engage in self-organization," he said. "It gives people the ability to organize without organizations like FEMA." And far from making the recovery effort disjointed, Seeger said this new emergency management network is actually more resilient than its ancestors. But like with anything that has been crowdsourced, there are inherent dangers with taking people at their word. "If someone says something is true and it's shared a million times, that doesn't mean it's true," said Kaethe Beck, lead researcher for the Social Media Analytics and Reporting Toolkit (SMART), a project being funded by the Department of Homeland Security and developed by the Center for Visualization and Data Analytics at Purdue University, a Department of Homeland Security Science and Technology Center of Excellence. The Web-based tool uses keyword filters to analyze and map social media posts from Twitter, Facebook and Instagram. The SMART project has been used as an early warning monitoring tool at the 2013 Boy Scouts of America Jamboree in West Virginia and recently with the National Weather Service to monitor severe weather events. Beck has seen firsthand the power of the tool to take large amounts of information and make it manageable, or actionable for first responders. During Superstorm Sandy, for example, the tool showed once evacuation orders were given, instead of leaving, many people went to the grocery store presumably to stock up on supplies. "That's important for first responders to know, right," she said. "If I have to [send people to] rescue people, maybe check the grocery store." But with things like tornadoes, the patterns sometimes break down, she said. "People will tweet where clouds are rolling in, but they're not meteorologists," she said. "Still, it's an alternative source of information that people don't always consider." Seeger, at Wayne State University, said the field of social media as an aid in disaster management is evolving quickly -- or, as he put it, "the bird is moving." But he cautioned that the organizations using the data need to be cognizant that not everyone is glued to his or her phone during a disaster or uses social media, so the systems using this information need to be flexible. "No disaster is exactly the same as another disaster," he added.